The 2018 football state champion New Palestine Dragons. Photo by Shelby Horsley. A strong start gave the Dragons a 14-0 lead, but NP gained separation with a huge finish to the first half. 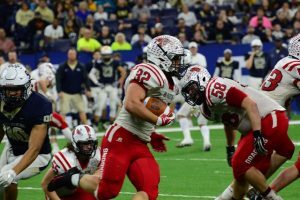 Junior Charlie Spegal runs for some of his 228 yards during the state title game. Photo by Shelby Horsley. Leading 14-6, NP took over at its own 27 with 1:00 to go in the half. QB Zach Neligh rushed for 43 yards down the right sideline, then hit Colby Jenkins over the middle for a 30-yard TD that gave NP a 21-6 edge with 44 seconds left. Four plays later, Jacob Hockett picked off a deflected pass, giving NP the ball on the Hawks’ 35 with 14 seconds left. After an 8-yard run, Charlie Spegal took the last play 27 yards to the end zone to give the Dragons a 28-6 edge. Spegal ran for 228 yards and two touchdowns, giving him a state-record 70 TDs for the season. 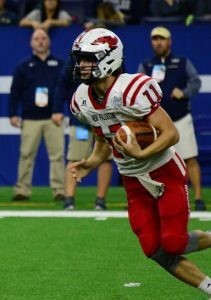 Neligh ran for 45 yards and a score and threw for 56 yards and a touchdown – with two completions and 46 yards to Jenkins. The Dragons outgained DC 325-317 in the contest, including 269 on the ground. DC had 172 on the ground and 145 through the air, but NP forced two big turnovers – both interceptions by Hockett that led to scores. Senior quarterback Zach Neligh runs for a first down in the Dragons victory. Photo by Shelby Horsley. NP built an early 14-0 lead. The Dragons drove deep into DC territory on the opening drive, led by a 51-yard run by Spegal, but a missed field goal kept the game scoreless. The Red Rage got stops on DC’s first two drives, and the Dragons eventually cashed in with a 12-play drive that finished with Neligh’s 20-yard run on the first quarter’s final play. The key play of the march was a 16-yard pass to Jenkins on third-and-16. Neligh’s touchdown scramble came on third-and-15. Three plays later, Hockett picked off a pass and returned it to the 6, setting up the first of Spegal’s two TDs. DC responded with a touchdown drive on a 24-yard pass to Kenny Tracy, cutting the lead to 14-6. In the second half, DC drove into NP territory on its first drive, but the Dragons held on downs. The Hawks scored with 7:15 left, but NP was able to recover the ensuing on-side kick. The Dragons had to punt the ball back to the Hawks, but they turned the ball over on downs on four plays, allowing NP to run out the clock. Senior Luke Ely was named the Phil N. Eskew Mental Attitude Award recipient, the second Dragon to be so named, joining Alex Neligh in 2015. 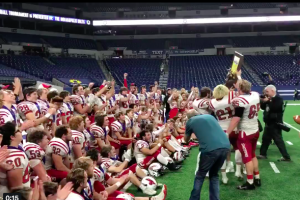 Saturday’s title was the second for the football team in four State Finals appearances. 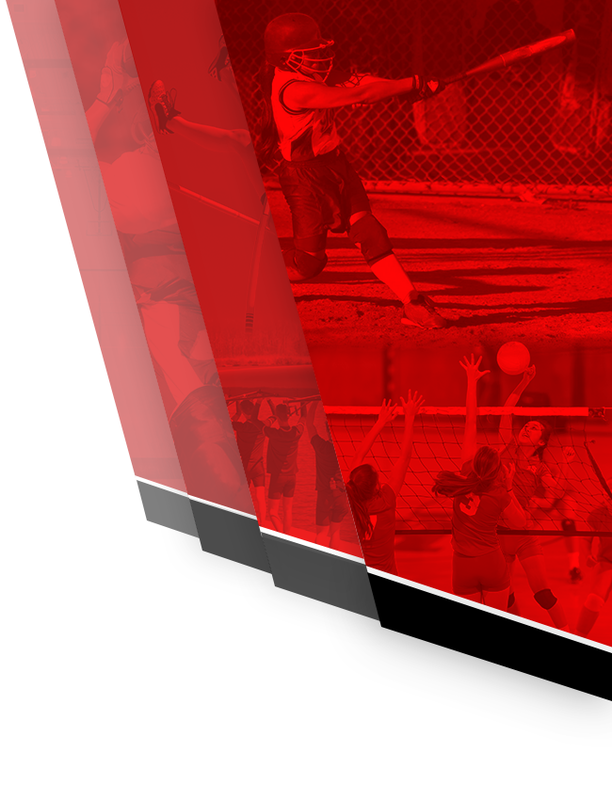 It was also the eighth team IHSAA state championship in school history. 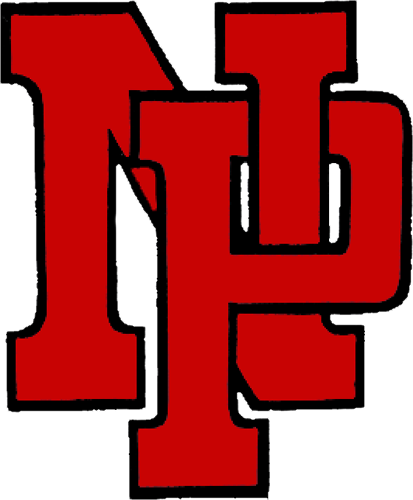 NP has won state titles in baseball (2004), softball (2004, 2007, 2008, 2017, 2018) and football (2014, 2018). 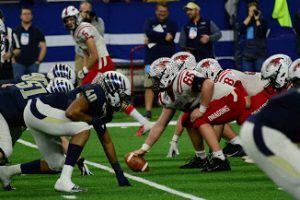 Notes: The Dragons finished the year with state leaders in kick scoring (Alex Kropp 119), sacks (Kyle King 17) and rushing yards (Spegal 3,358). Spegal also set state records for total TDs (70) and rushing TDs (68). … Neligh finishes the year with 1,576 passing yards and 1,047 rushing yards, becoming the second Dragon to post two 1,000/1,000 seasons in school history. He finishes his career with 3,462 passing yards and 2,362 rushing yards. He ranks third on the NP career passing list and second on the total offense list. … Jenkins’ TD reception gave him 20 for his career, tying him for third all-time at NPHS. He finishes with 1,617 career receiving yards, third-most in NPHS history. 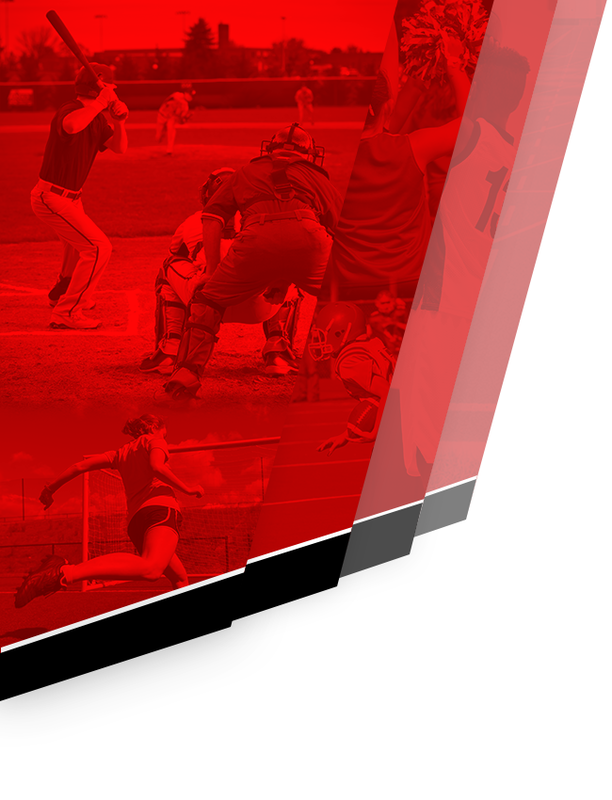 … The Dragons finished the year with 789 points, third-most in school history. The 6,732 yards gained this season are second-most. … NP finished the year plus-29 in turnover margin, with 35 takeaways and six giveaways.